Beef Barbacoa roasted low and slow in the oven crusted with a flavorful spicy chipotle chili vinegar mix makes the ultimate Mexican beef tacos, burritos and more. We are a huge fan of Mexican recipes on the blog including Fish Tacos, Shrimp Tacos and more served with my super popular Refried Beans and Mexican Rice. This is the Ultimate Barbacoa recipe for the most mouth-watering barbacoa that you’ll ever make. 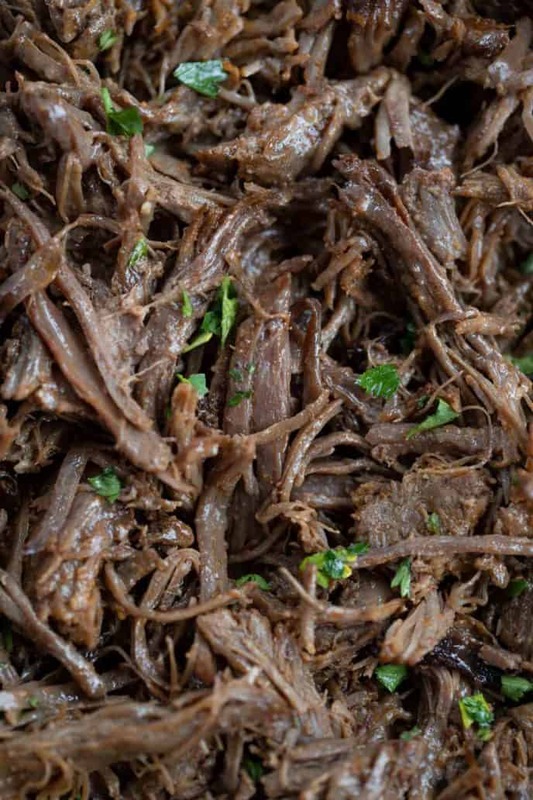 Most people didn’t used immediately think of Barbacoa Beef as the most popular Mexican beef options (classic Taco flavors and Carne Asada used to win out), but with Chipotle becoming such a popular restaurant everyone wants an Easy Barbacoa recipe. 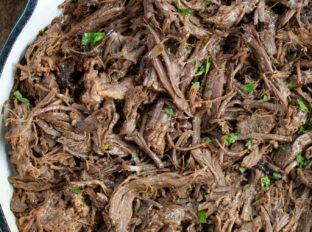 Shredded barbacoa is most often a filling for food like quesadillas, tacos, and burritos, but it can also be used as a topping for salads or eggs. Chipotle Mexican Grill barbacoa beef is a signature dish of the restaurant. 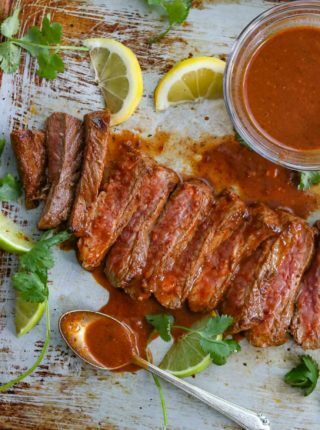 The company’s website shares the barbacoa ingredients which obviously start with beef then layer the flavor with chipotle chili, bay leaf and a combination of herbs and spices including cloves, cumin, garlic, oregano, black pepper and salt. We use similar ingredients in our barbacoa recipe to achieve a tender and juicy slow cooked meal. There are two steps to preparing the ingredients and then you have options for the cooking method: make the sauce and prepare the meat. First use a food processor to mix the seasoning for the barbacoa sauce. Chipotles in adobo are the key to that smoky, spicy flavor. Puree the chipotles, vinegar, lime juice, garlic, cumin, oregano, black pepper, salt, ground cloves and chicken broth until you have a smooth sauce. Set it aside while you move to the second step of browning the beef. We use chuck roast (also known as shoulder roast) because it’s an inexpensive cut of meat that transforms from tough to juicy and tender. The connective tissues in the meat break down if you cook it low and slow. 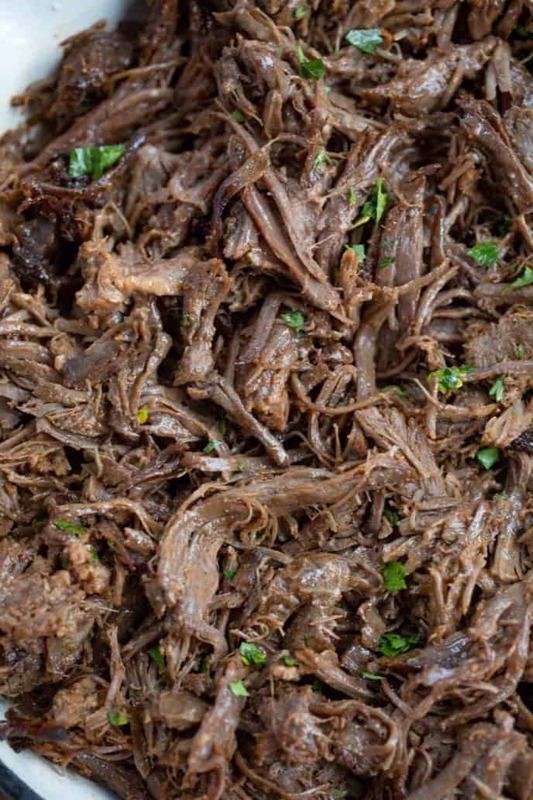 Barbacoa is Mexican spicy shredded beef made traditionally in a braised dutch oven low and slow over the course of 4 hours (this is how I love preparing it too). Since there isn’t any added sugars in the recipe it is naturally low carb and the recipe also happens to be dairy-free and gluten-free. Barbacoa may sound fancy but it’s just a style of meat slowly cooked with seasonings. You could make barbacoa chicken, beef, lamb or pork. Many people think you can only really make carnitas from pork but with the right mixture you can make barbacoa with any protein you’d like, even in the slow cooker. Sometimes if we’re making a barbacoa bar we make a large amount of the seasoning, toss it with many different meats then cook them in smaller sections in the slow cooker like this Thanksgiving recipe where sections of the slow cooker are portioned off. 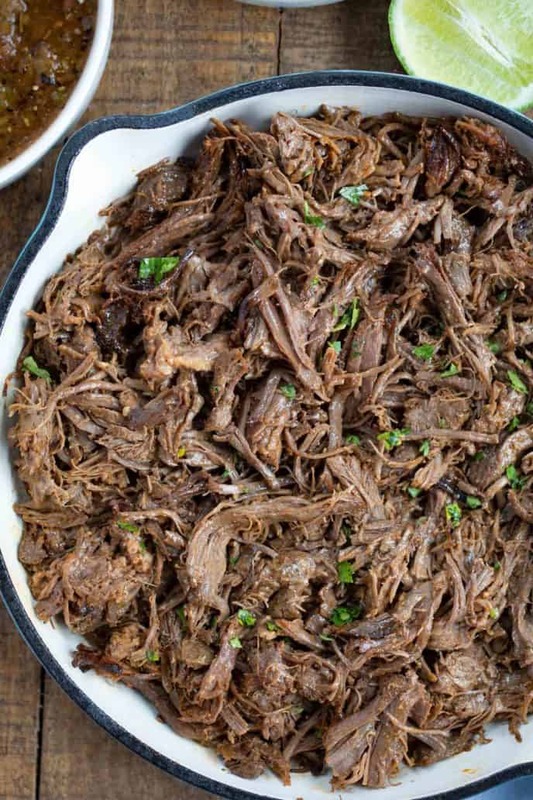 Many people love to make this in their slow cooker or instapot (check out my slow cooker recipes) which is a great and easy option, but in keeping this the ULTIMATE beef barbacoa recipe I like to make it in the oven because it keeps the recipe just a bit more melt-in-your-mouth tender. Chuck Roast is the best cut of beef for Barbacoa because of the marbling of fat throughout. A leaner cut of beef will not stay as tender. In a pinch you can use short ribs or a brisket, but both cuts would also be more expensive than a beef chuck roast. The most important thing when working with the chuck roast in this recipe is to be sure to brown the beef well before braising it, this will create a great crust on the outside of the roast allowing it to have more texture even after spending 4 hours braising in the oven. Even if using a slow cooker (crockpot), the use of a beef chuck roast is best. 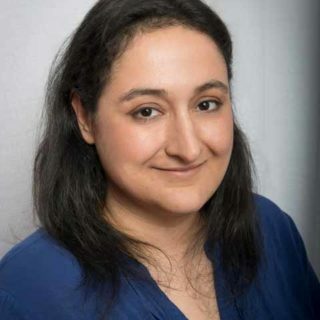 You can buy dried chipotle (or ancho, guajillo) peppers which you rehydrate in boiling water for an authentic barbacoa recipe or you can use the canned adobo chilis in sauce. The swap with the canned sauce is a quick and easy option I highly recommend, just be aware they are very spicy, so if you have an aversion to spice you are going to want to halve the amount of peppers. 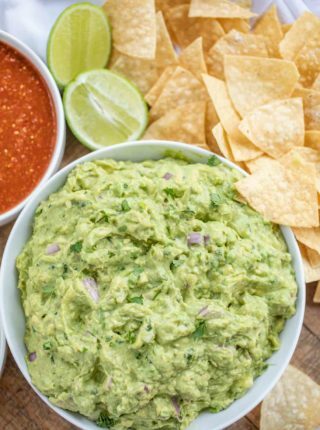 You can make your own copycat burrito using this recipe topped with Chipotle’s Corn Salsa, Chipotle Guacamole and serve it alongside my spot on copy of the Chipotle Tortilla Chips! Add the ingredients to your food processor, sear the beef (seasoned with salt and pepper) on the sauté setting, then add it to your instant pot with 2 cups of beef broth. Cover with the chili mixture set the pressure to high and cook for 60 minutes. Release the pressure fully, shred with two forks and serve. Add the ingredients to your food processor, sear the beef (seasoned with salt and pepper) then add it to your slow cooker without any of the added beef broth. Cover with the chili mixture and cook on low heat for 8-9 hours, shred with two forks and serve. Using a small corn tortilla top with shredded beef, chopped white onions or pickled red onions and fresh cilantro. Add vegetable oil on medium high heat, season the beef with salt and pepper and sear beef on all sides, then turn off the heat and add in the beef broth and pour over the sauce slowly (try to keep it on top of the beef). Add the vinegar, bay leaf, garlic, cumin, oregano, cloves, lime juice, lime zest and chilis with sauce and process until smooth. Cover and bake for 4 hours then remove from the oven and shred apart before serving. Quick question! I’m making this right now in the crock pot for dinner tonight. I see it has no added beef broth, so i completly leave the 2 cups out? Also, reading it it mentions chicken broth but notnin the ingredients section. Do I need to add chicken broth or any liquids? Thank you! Thanks for catching that! That should’ve read beef broth in the instructions. So, when do you add the beef broth? You’ll add in the beef broth in step 2. 🙂 Enjoy! Lovely recipe loved the way you described and made it so easy for the users. Oh wow, that looks SO incredibly good! 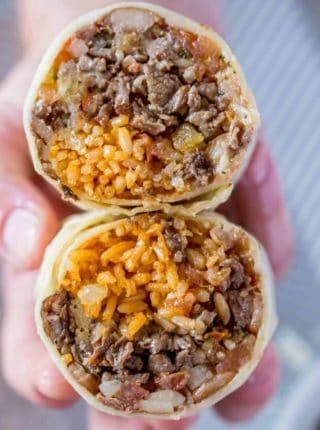 My mouth is watering looking at the photos! This looks so moist and flavourful! Will be trying this one asap! Great to have a batch on hand to use in dinners throughout the week! 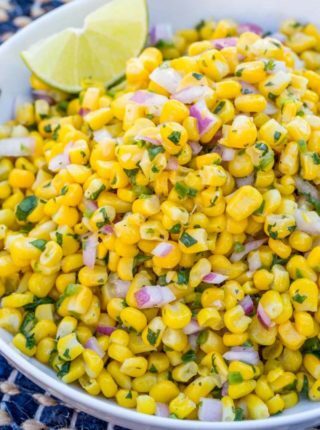 So perfect to use for different dishes. My family is obsessed with Chipotle and love that we can stay on budget and make it at home now, thanks! It’s so good! What vessel are we to cook this in? Dutch oven. You can also use a slow cooker if you’d like.